Snow mobile on a night ride on the way down to the refuge at Kinnvika station at the end on the 60 km route from Vestfonna. Photo: Veijo Pohjola. During three hectic days between 9-11th April 14 persons, and several tons of goods was flown from Longyearbyen with Airlift helicopters to man the Kinnvika station, and formed the first and second legs of the IPY-KINNVIKA spring expeditions. It was an exchange of personnel 30th April, and the last contingent flew out 12th May, when they were shifted with the third leg, comprising of 4 person climatology team from University of Aachen and Berlin Technical University who would stay in Kinnvika to the 1st of June. a logistical team of 3 persons from the Swedish Polar Research Secreteriat. Reports from each team are given separately. Needless to say, the thematic boundaries between the groups were amorphous. The nature of this kind of field work crosses the boundaries due to the art of science and the strains of logistics. The results of the spring activities are summarized by the figure below showing stations and traverses driven on Vestfonna and its surroundings. The figure above show Storsteinhalvøya and Vestfonna (Landsat XXXX-200X). The Kinnvika in Murchinson Bay station is to the left limit of the picture. The activities spring 2008 were along and at the different symbols and lines in the image. 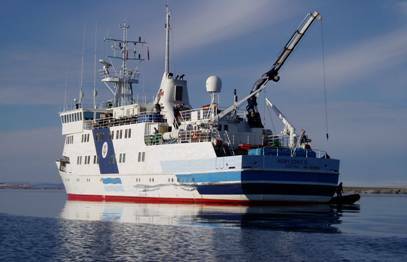 The plan for the Kinnvika 2008 summer operations was to form two legs of activities, where the first leg (or 4th leg in the 2008 operations) to be shipped in with the Polish RV Horyzont II in the period 9-13th July and to be helicoptered out by Airlift in August. an Ice and Fiord Sedimentary Biology team of 2 from University of Sheffield and British Antarctic Survey. Personnel from the Swedish Polar Research Secreteriat where joining to do some maintenance on the machine park of Kinnvika, and personnel from University of Lapland to recover a depot of drill equipment left on Vestfonna during the spring operations. RV Horyzont II in Kinnvika summer 2007. Photo: Veijo Pohjola. These teams where planned to use Kinnvika as a base station, to have temporal satellite camps around Murchinson Bay, and use transport by a newly purchased RIB-boat. The ice conditions in the Norwegian and Barents Seas were harder than usual and with thick pack-ice drifting to the south west along Hinlopen barred ship transport in this area most of July. At the time of our try with RV Horyzont II the ice was having an average thickness of 1.2 m and to thick to force through. Two days earlier RV Lance under the flag of the Norwegian Polar Institute had left Longyearbyen to go up to Hinlopen to set out fuel depots along the coast. Kinnvika was one of the stops, where 7 tons of petrol was to be delivered. Lance got stuck for a couple of days in the pack ice at Widjefjorden, and had to return to Longyearbyen. Horyzont was further south at Magdalenafjorden, and turned back at the same time. Some of the teams had a chance to try a few scientific exercises at Magdalenafjorden, but else than that the summer expedition of was a disappointment. This is though how field work in the Arctic is like – weather shifts largely up here, and this summer was probably the most inhospitable in a row of many years. Snow came all the summer and even if the ships would have reached Kinnvika, little of the planned work could have been achieved since snow fall appeared all summer, and covered the sites of interest. Further, Murchinson Bay was covered with ice into August which would have inhibited the use of the RIB for a large part of the season. RV Lance (left) jammed in the pack ice of the Hinlopen Strait July 2008. Photo by Espen Lengard, Kystvakten, www.mil.no. 2008-07-15. On the right is KV Svalbard, the ice breaker from the Norwegian Coast Guard that assisted Lance to escape the ice ( http://sv.wikipedia.org/wiki/Isbrytare ). 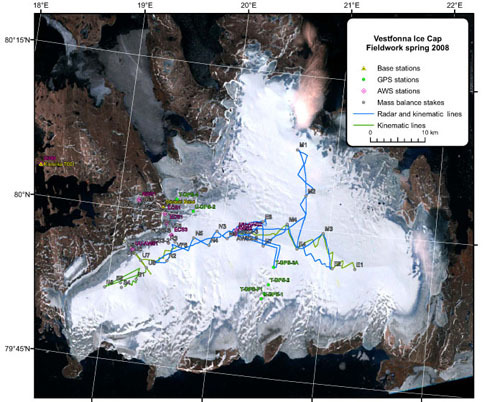 A fifth leg was formed by of the 4 person climatology team from Bonn University, University of Aachen and Berlin Technical University, revisiting the stations placed out in the spring. They flew in 5th of August and stayed in Kinnvika / Vestfonna to 18th of August, snowshoed from Kinnvika to Vestfonna, and back, and finally SS Arctica picked them up and sailed them back to Longyearbyen. The Kinnvika 2008 though continued after this. Due to the adverse ice conditions we were not only abandoning a large part of the summer activities, we also were devoid of fuel for the coming 2009 spring activities. SS Arctica brought 3 drums of petrol when the embarked the climatology team, which was a good start of re-building out fuel depot. But still we had 6.400 liters to go. At the end of August RV Lance and the Norwegian Polar Institute visited Kinnvika and delivered the fuel depot at the shores of Kinnvika. Furthermore, due to the unsuccessful ice drilling operations (see report from the ice core team), and the large problem with weather up on Vestfonna we had left 3 depots, of ice drill, camping gear and a broken snow mobile on Vestfonna. Repeated tries to sling it down with helicopters during the summer, with assistance from Airlift, The Governor of Svalbard, and the Norwegian Polar Institute failed due to adverse weather. The 11th September operations by the Norwegian Coast Guard and their ship KV Svalbard managed as a part of a rescue exercise to sling the gear down to Kinnvika, and to take the ice core drill to Longyearbyen for maintenance. With this we end the IPY-KINNVIKA 2008 activities, and we now can put a successful 2008 campaigns in the books for many of the KINNVIKA projects, and we have the means to faithfully look forward for the 2009 campaigns. In total these activities summed up to 555 mandays at Kinnvika / Vestfonna done by 23 different individuals, who consumed 4300 l of petrol (~1700 hrs of snow mobile driving) and used 38 hrs of helicopter flights, and was aided by three different ships. We are grateful to all that have helped and assisted IPY-KINNVIKA to succeed during the 2008 campaigns. Among these the services and strengths of Airlift, The Governor of Svalbard’s office, The Norwegian Polar Institute are deeply acknowledged. The Polish Academy of Sciences and The Swedish Polar Research Sectereriat has largely assisted our logistical strains, and been superb supporters of our endeavors, and The Norwegian Coast Guard exercised an excellent ice drill “drill” when they recovered our deserted depot at Vestfonna. We have further been supported by financial means Metsätissue/Serla oy, The Nordic Council of Ministers, The Polish Academy of Sciences, The Swedish Science Council and The Swedish Polar Research Sectereriat without which we would have been grounded long time ago. We are also grateful to Naviga, Restaurang Busen, and Ingenjör Poulsen AS their services.